Skate sharpening by mail might sound like an overkill if you live in a metro area with ice rinks, but there are plenty of skates and hockey players who do not live near a rink. Even if you do have a rink near you, chances are the guy behind the sharpening machine is just a kid who just learned to sharpen skates. Sharpening ice skates is an art, you can’t just grind it against the wheel and hand it back to the customer, it takes years of practice to be a skillful sharpener. One slightly wrong movement or uneven pressure and your edges are off, and if your edges are off your game will be off. If that sounds like your current situation, skate sharpening by mail service might be the perfect choice for you. Whether you just don’t have the time to get to the rink, or spend the time waiting to get 2 or 3 pairs of skates sharpened or the operator destroys your edges and you know it as soon as you step on the ice. If you live in a remote area with no ice skate sharpening in your area this maybe your solution to keeping your edges sharp. 1. Go to their website and fill out the form for your preferred radius of hollow. 2. Remove the blades from your skates, wrap them and mail to SkateSparx. 3. Sit back and relax, you will get your blades back typically within 5 days. 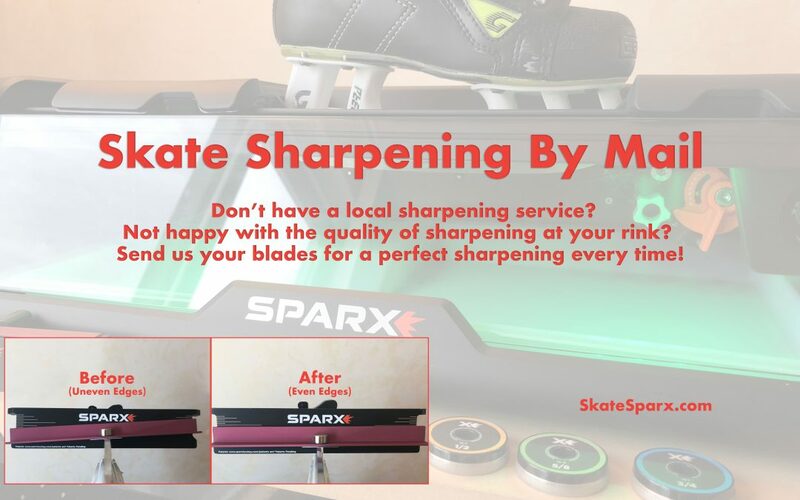 SkateSparx Ice Skate Sharpening uses a state of the art automatic skate sharpener. The machine eliminates all operator error and creates a perfect smooth edges every time. No matter what radius of hollow you prefer Sparx gives you the consistency every single sharpening.